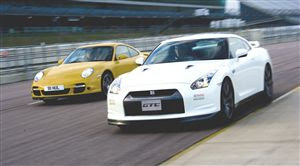 "Nissan GT-R vs Porsche 911 Turbo – it’s the clash of the year. And CAR has pitched the benchmark Porsche against the first GT-R to arrive in the UK, and you can watch the video at the foot of this page." "Two blown, four-wheel drive cars, each nudging the 500bhp mark, head-to-head on Rockingham’s infield circuit. In the first part of our video, assistant editor Ben Barry takes out the 911 Turbo to set the time for the GT-R to chase. But then the storm clouds blow in…"
I know the results, sorry, can't tell you until Monday when the Magazine releases.